Never ask "why build a screen room?" as a homeowner in the Washington D.C. metropolitan area. They protect you from mosquitoes in July and August; they shield you from the summer sun but not the spring breeze; and they can be fitted with fans to make your own breeze. 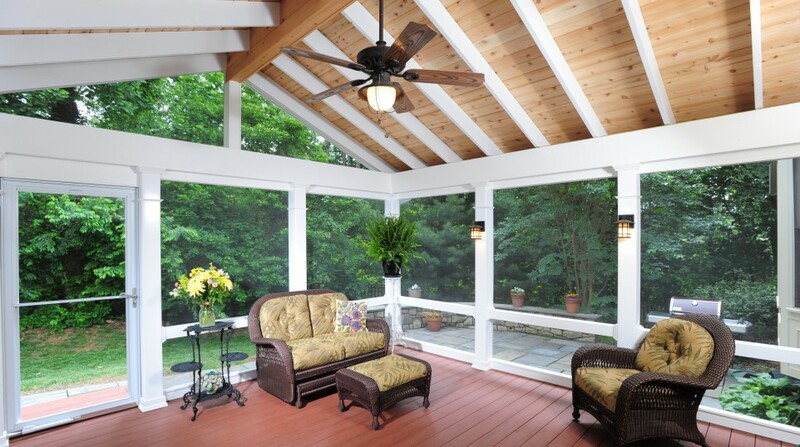 Browse our portfolio to view the kind of designs open to screened porches. 1. Location - Where are you going to put the screen room on your home? Having the room close to the kitchen is key! 2. Lighting - Remember to keep in mind natural light and how it affects your house at all hours of the day. 3. Design - You'll want your new room to match the house its connected to! 4. Furniture - Think of what furniture you plan to put in your space and how you plan to use the room. 5. Flooring and Railing - What type of floor and rail works best for you? You don't need to know the specifics during your planning stages so much as what they will have to endure and be exposed to.